Age is probably catching up with you, and you probably need a sturdy walking cane to stay mobile. As you age, joints crumble and muscles weaken causing problems with balance or pain/weakness in leg, foot or hip. To counter these effects, many doctors recommend walking canes as a remedy. A walking cane will allow you to access areas and distances you would otherwise find difficult to walk independently. It can also be carried as a defensive weapon or be a fashion accessory. If you have limited mobility, there are many options available for you in the market. However, not all walking canes are created equal. Some canes are height adjustable while others have LEDs to help you walk your way in the dark. There are various kinds of canes, so it’s vital to know the features as well as pros and cons of each. Knowing what to look for will help you make an informed choice. When it comes to walking canes, quality is non-negotiable. You shouldn’t be burdened with the constant worry that your cane is going to break. You need a solid and robust cane that will give you years of service. With so many options in the market now, some unscrupulous manufacturers opt to use cheap materials to create poor quality walking canes that don’t meet the users’ needs. While the market is flooded with walking canes, some models and brands have proven to be better than others. Choosing a walking cane is not exactly the easiest task. Thankfully, help is at hand. If you are in search of a high quality, unique and fashionable cane to get you up and walking in the streets, you are in the right place. We present to you 5 of what we think are the best walking canes for 2019. If you’re in search of stability, then this is the best cane for you. Made out of aluminum, the Hugo Mobility Quadpod Offset cane is durable but lightweight as well thus providing its services for a very long time. Its tip is ultra stable with the manufacturers making it 54% lighter but 80% more compact than the other large quad canes; a feature you would appreciate. Another unique feature that qualifies this cane to our list is its ability to stand on its own. Users don’t have to lean it against the wall or place it on the floor when not using it. interesting, right? This feature is attributed to its quad design that enables it to re-center itself. In addition, the cane is adjustable with an easy push button allowing users to adjust to different heights dependent on their preference. It is designed for people between heights 5′-6.5″ and can stretch from 71 to 99 cm. Its ergonomic handle is a shock absorber for maximized comfort. It also contains a reflective strap to increase safety during the night time. SUPERIOR STABILITY AND TRACTION ON ANY SURFACE: Safely navigate over any surface, indoors and out. The quad cane base provides greater traction on smooth surfaces such as hardwood, laminate or tile floors as well as greater stability on uneven surfaces such as grass, sand, gravel or plush carpets. The versatile cane is made with a durable anodized aluminum frame that is adjustable from 28" to a maximum of 37" and supports up to 250 pounds. NONSLIP, FOUR-PRONGED BASE: Easily switching from the left to right side, the four prong base locks into place providing additional support without interfering with a normal stride. Each prong is capped with a rubber, non skid, non-marking tip for added stability and convenience. The square base allows the cane to stand upright while remaining compact enough to easily fit on stairs or in narrow passageways. COMFORTABLE ERGONOMIC GRIP: Fitted with an ergonomically contoured hand grip, the cane handle creates a secure, yet comfortable grip perfect for daily use. The handle also includes a wrist strap for added convenience. CORROSION-RESISTANT LIGHTWEIGHT FRAME: Constructed with a durable anodized aluminum, the quad cane is lightweight and corrosion-resistant. Dual security features include an easy to grip locking knob and brass locking pin ensure that the cane stays at the set height without slipping. Staying true to its course, the high-quality Vive Quad Cane allows for safe navigation and movement regardless of the terrain. Traction is more significant on smooth surfaces and more stable on rough ones such as grass and gravel. Also made of Aluminum, the Vive cane is highly durable, sturdy and comfortable. It is considered one of the best walking cane available in the market. Why? You may ask. 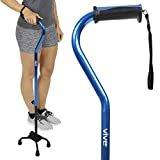 Well, like other walking canes it is also adjustable; but unlike other canes, it is adjustable from heights 28” to 37″ making it usable by anyone. To ensure that the set height doesn’t slip, the cane is equipped with an easy to grip locking knob. Wear and tear is a thing of the past with the Vive cane; thanks to its anodized aluminum material. On top of that, the cane comes with a four-pronged non-slip base made of non-stick rubber. The reason behind this is to make users safer by providing an extra grip and stability. Lastly but not least, the cane comes with a wrist strap for added security. The name Medline isn’t new to the medical field. For over 50 years, Medline has been entrusted to supply its products to different hospitals and health institutions thanks to its reputation for quality. This is also true for the Medline Offset Handle Cane. Walking with this cane is efficient because its design makes the users’ weight get centered over the most substantial parts of the cane. 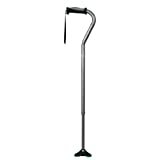 The Medline Offset Handle Cane is proficient for balance. Its unique design provides maximum support and comfort and in turn, reduces the risk of falling. Just as the Hugo Mobility Cane, it possesses a push button allowing users to adjust its height to their preferences. The cane is simple to use and makes it convenient for simple tasks that require different heights. 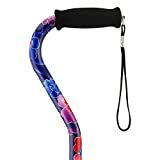 Another feature of the Medline Offset Handle Cane worth mentioning is that it is secured with a locking ring. This is for quiet and rattle-free use. It is also for added safety. It is a good cane for those on a budget as it doesn’t leave a big dent on your wallet. Talk of fashion and quality, the Duro-Med Wooden Cane blends them all. If you’re in search of a distinguished and fashionable look as well as a cane that will serve its function just as well, this is your cane. The Duro-Med Cane is made of high quality material and comes at 36 inches, though users can cut it short based on their height and needs. Just like its name suggests, the USA made cane is designed of wood and sealed with a smooth finish for a glossy look and comfy feeling. It is inserted with metal inside to make it light, durable and stable. Users don’t have to worry about longevity while purchasing this cane. Lastly, its tip is made of non-slip rubber to ease traction. The manufacturers guarantee quality and maximum performance as well as providing them with a limited warranty. That’s an offer very few manufacturers can guarantee. If you are in love with fashion and want to have that stylish look, the NOVA Medical Designer cane is exactly what you need. It is a quiet cane for users who love style and fashion. Moreover, you don’t have to worry about the design fading away thanks to the chip and fade resistant finish. The electric cane’s handle is designed to accommodate more gravity and provide support. This goes a long way in reducing pain and cramps to the wrist and hand. The cane is adjustable between heights 30” and 39” making it suitable for people within 6’4” tall. In addition, it is equipped with a locking silencer that prevents rattling, keeping the cane in its desired position, and making it safe and firm. The cane’s function is further boosted by the slip-resistant rubber tip and a carrying strap. The list above outlines the best walking canes you should consider purchasing in 2019. Every detail about the canes has been carefully considered and crafted out – they are stylish and fashionable, made of high quality, come with unique features and provide users with maximum functions. They are the best money could buy. Invest in the right walking canes and you wouldn’t have to worry about your safety while walking, height, wear and tear or being out of fashion and style. Click here to learn more about the Best Walkers for seniors on the market.